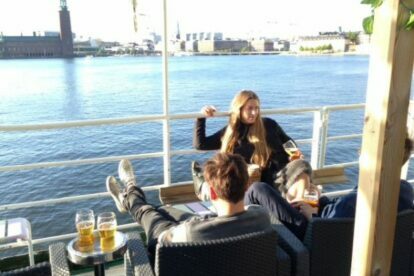 Seaside Söder is a hotel, bar and restaurant, located on a two floored boat anchored alongside the water on Södermalm. This place is blessed with an absolutely fantastic location, and a magical panoramic view as well. From here you’ll spot Stadshuset (the city hall) across the water, trains that quietly arrive and leave Stockholm central in the distance, and an effective sunset. On your way here you’ll also pass all different kinds of quirky boats laying along the quayside. Seaside stay open all year around. So don’t be fooled by my picture. From the little bar you can order all kinds of beverages, take a seat at the sofas, and borrow some of their board games. And you kind of have to order their pizza, it’s surprisingly amazing. Seaside Söder is my absolutely best-kept secret in Stockholm.